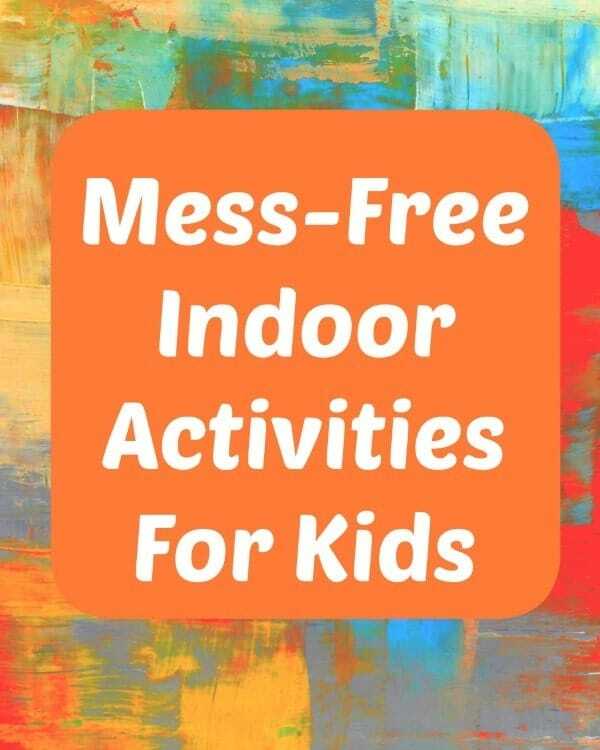 I’m always trying to think up indoor activities for kids that don’t involve setting them in front of a television or electronic device. I want them to interact, be creative, and make memories! While I do sometimes let them break out art supplies or build forts, I also enjoy days when cleaning up from fun doesn’t take longer than the fun itself. 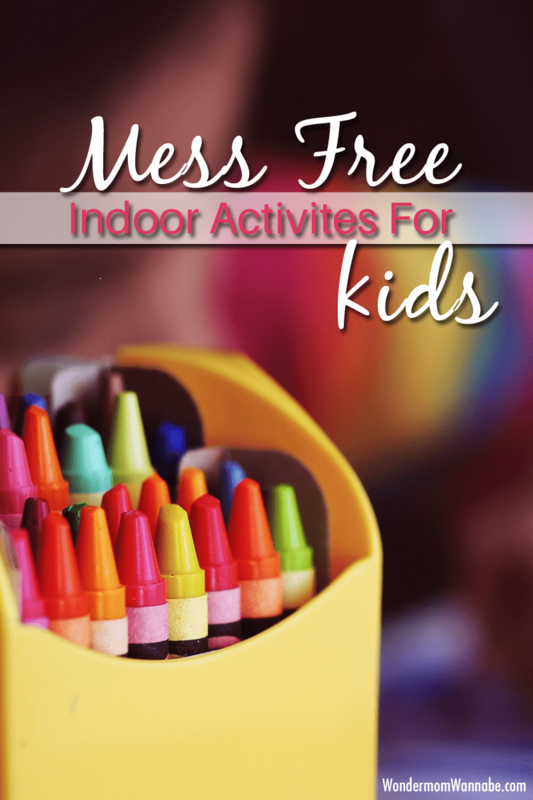 That’s why I love these mess-free indoor activities for kids. The kids still have great, screen-free fun and my house isn’t a wreck when they’re done. Do you know what’s more fun than watching music videos? Making them! Depending on your family’s talents, kids can do everything from making up the song and accompanying choreography to editing the video with cool visual effects. They can also just lip sync to a song and put on performances for one another. Even shy kids enjoy this activity because it’s a chance to role play in a safe environment where no one will laugh cruelly at them for doing something silly. If you follow me on Instagram, you know my teen daughter is constantly selfie bombing my phone (filling up my SD card with pictures of herself). Kids love taking pictures of themselves and others and with so many tools to take them with (cell phones, handheld gaming devices, tablets, and digital cameras), it’s easy to equip them for it. Extend the length of time they spend on this activity by encouraging your kids to edit their photos when they are done taking them. There are tons of free apps and software available (many of them probably pre-loaded on your devices). We are all familiar with the classic game of hide and seek. Sometimes though, when played indoors, this can be frustrating to the mom who isn’t playing the game but constantly has kids running past her or trying to hide in the pile of laundry she is trying to fold or under the desk where she is working. I find it far easier to give the kids a stuffed animal to hide. It’s smaller, so it can hide in places that don’t interrupt what you’re doing. And because the stuffed toy doesn’t have to make it to “base” to be safe, there is no running around the house. One of my family’s favorite games is treasure hunt. I make up clues that they have to figure out to lead them eventually to a treasure. You can read my post on Treasure Hunts and Scavenger Hunts for some free printables so you don’t have to create your own. However, to buy yourself some extra productivity time, have the kids create their own. If the kids are really bouncing off the walls, I throw out a fitness challenge (this works particularly well if your family is competitive). If you need some ideas of what types of activities to throw at them, you can choose some from my Wakeup Workout. Exercise may not be our idea of fun, but for some reason (probably because they’re younger, with more energy and fewer achy body parts), kids still enjoy it. My youngest daughter is famous for declaring after every commercial, “I want that for my birthday”! Since she’s so easily won over by product marketing and has the attention span of a child, her declarations are not reliable tells of what items might really be the most appreciated when her birthday finally rolls around. That’s why I like to get her to tell me what she wants when she isn’t watching television or just home from her friend’s house (who, of course, has all the cool stuff she wants). And since kids are inherently selfish, if you tell them you’d like them to make a list of all the things they want, you only have to arm them with a pencil and a piece of paper (or two or three) and you just bought yourself half an hour. As I mentioned at the start of this post, I’m ALWAYS trying to think of fun activities for kids. If you liked the ideas above, you might also enjoy some of these other activities. I particularly like the rock star! Think we might have to try that one. Maybe our kids will be famous?? LOL. Mine have managed to do that too. I think it’s easy to be messy when you aren’t obsessing over having to clean it up. What a bunch of great ideas! I saw there is more snow in a lot of areas. I hope you keep your sanity. Thank you so much for linking up to Tips and Tricks. Hope to see you again this Monday at 7pm! Thanks for taking the time to stop by and visit. I’ll definitely be back to Tips and Tricks. Corinne, you have me laughing that you throw out a fitness challenge to your kids. Me, I say, “Let’s bake cookies.” Next time I’ll have to try cookie baking after 50 push-ups. I really love these ideas, but I think my favorite is the wish list. This would have kept my daughter busy for hours when she was young! Heck, I think it would keep her busy now too!